Actually, I have already had the baby – thank you for asking. A new mom delights in being able to see her toes again, but it may be a while before she fits into her favorite fashionable clothes. Nursing brings its own sartorial challenges. Luckily, she has lots of choices. Baby clothes are fun, but transitional clothes for the new mother in your life may be the best gift of all. Choose washable, stretchy pants and soft loose longish tops for comfort. Lulu Lemon and Athleta have a good selection and you will be able to use them later. Here are other options. My daughters LOVE these Susana Monaco leggings for both pregnancy and post-partum. They stretch to fit the bump but don’t stretch out and are great afterwards. They’re thick enough that they can be worn as pants and soft enough that they can be worn as PJs. $121.00. A new mom will probably want nursing tops and ‘hooter hiders’. A great shawl or scarf can double as a nursing cover while breastfeeding in public. My daughters’ favorites are Bebe Au Lait’s hooter hiders, which are specifically designed for breast feeding and have a rigid neckline so that mom can peek at her baby while she feeds. $36.00. Ingrid and Isabel has a great “nursing essentials” gift set with a luxurious shawl, tank, and bra. Three piece set $159. 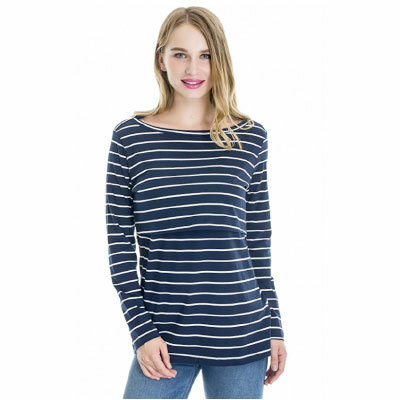 Breton stripes are the perfect staple and THIS is the top that my daughters all like. Five colors, $19.99 each. 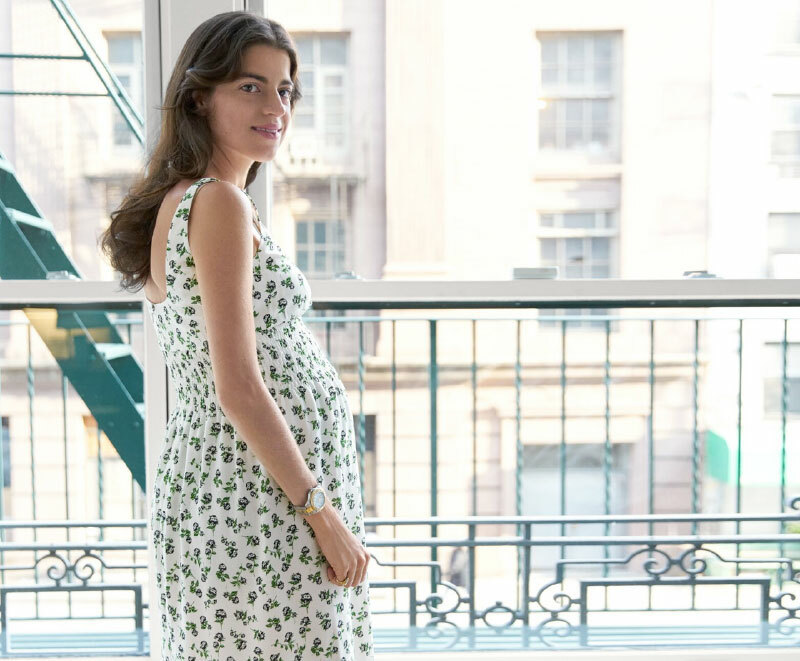 Rosie Pope is a great NYC based maternity designer who also has nice nursing tops. Dresses from $78 to $180. Ingrid & Isabel is a great SF based maternity designer who also has a nice nursing selection. Cross over jeans, on sale $59.99. Moms The Word, has a wide selection of nursing tops and stretchy clothing with a great mix of comfort, fashion, quality and price. The Hatch Collection offers high quality clothes which work during pregnancy and after. My daughters have used them through several pregnancies. Seraphine is a high-end maternity site. My daughters love their fancy dresses for attending weddings while pregnant and they have the best selection of high quality nursing tops. They have a celebrity following from the Duchess of Cambridge to Kate Hudson. My daughter’s friend has a Bay Area start-up called, Tilden – one wardrobe for the modern mother. She finds off the rack designer clothes that are pregnancy/nursing friendly. The website curates clothing by the stage of pregnancy and has a section for post-partum. Nightgown, PJs, robe and slippers all day? In an effort to “sleep when the baby is sleeping”, there’s a good chance a new mom is going to spend more time in her PJs than at other times in her life. Since she may have visitors or helpers around, it’s also important that those PJs are relatively presentable/ appropriate. Soft and practical – They LOVE the Nordstrom lingerie collection. They aren’t particularly expensive, but the pieces are all soft and stretchy for nursing. The online clothing rental options are ideal for this period. Wear great clothes without filling your closet with sizes you never want to wear again. For a personal stylist try Stitch Fix. After completing a style profile, you will receive 5 items on your doorstep. Keep what you want and return the rest. Co-Living – Not Dorms for Grown-Ups!